This week was significant for the field of nuclear energy in India with two events which have potential to decide the future of this key energy source. One was the nuclear fuel deal with Australia and other was the achievement of key reactor in Rajasthan. Both these events are testimony to potential of bright future for nuclear as solution to our energy crisis. So it was obvious for me to pick up the topic again (refer to earlier articles Nuclear Energy Adoption - Kudankulam Plant and Indo-US Nuclear Deal : The 123 Agreement) and put down some thoughts around these new achievements in the field. Australian Prime Minister Tony Abbott was in India this week to enhance bilateral cooperation and spent time both in Mumbai and Delhi during his two day visit. The visit witnessed a number of agreements between the two countries aimed at stepping up the strategic and economic ties. It was a significant visit as it would be foundation of how the relations between the two countries shape up in wake of new government at center in India and PM Abott having more than two-third part of his tenure still to go. Both leaders thus would have significant time at their hand to take their vision of this relationship forward. One significant outcome of the visit was signing of Civil Nuclear Agreement - the deal allowing for sale of Australian nuclear fuel (uranium) to India. 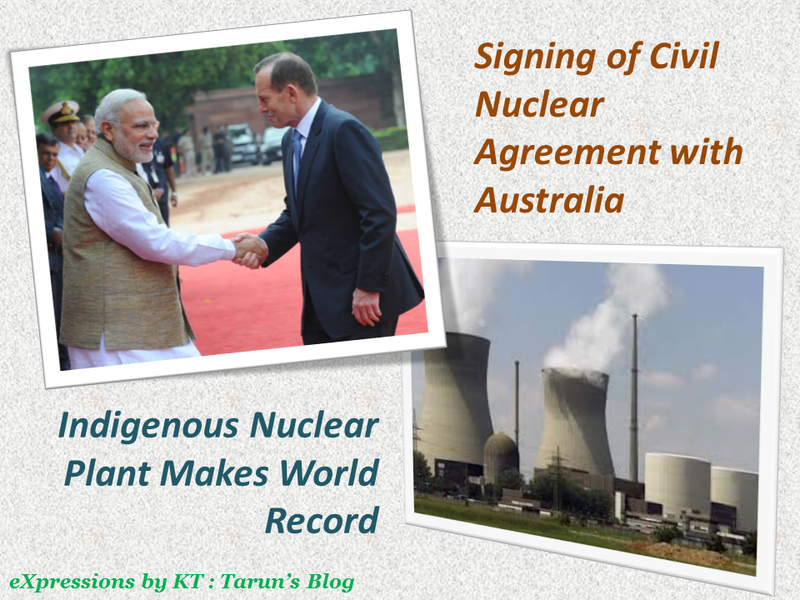 The deal, signed in the presence of Modi and visiting Australian Prime Minister Tony Abbott, officially marked an end to the ban imposed by Australia on selling uranium to India. Though the ban was lifted in 2012, when talks for the nuclear deal began but it was waiting a final seal before the trade in fuel could take place. One may argue the significance of this deal when we have similar agreements with the US, Canada, the UK, South Korea and France, among other countries. Well according to me this deal is not only about getting the fuel but putting forth a message to the world that we are being recognized as a credible and responsible nuclear state. Signing of such agreements in background of the fact that India is yet to sign Nuclear Proliferation Treaty (NPT), indicate that the world is gradually acknowledging the robustness of our democracy and confidence in our nuclear policy. On the potential of benefit from the deal, one needs to realize that Australia has about 40 per cent of global uranium reserves, of which it exports about 20 per cent amounting to more than 7,000 tons each year. This makes Australia one of the largest exporters of the commodity. This is more significant owing to the fact that country itself does not have nuclear power plants and hence there is limited possibility of diversion of these resources for inland use. India's nuclear plants are in dire need of nuclear fuel even as it struggles to ensure consistent supply of coal to its thermal plants. Moreover problems faced with hydro-thermal plants would make it imminent to expand the scope of nuclear energy production in India. India operates 20 mostly small reactors at six sites with a capacity of 4,780 MW, or 2 percent of its total power capacity, according to the Nuclear Power Corporation of India Limited. Based on many reports, the government hopes to increase its nuclear capacity to 63,000 MW by 2032 by adding nearly 30 reactors - at an estimated cost of $85 billion. However this would need significant cooperation from countries around the world. In wake of not signing the NPT, Indian nuclear plant industry has mostly been a domestic development with most research conducted in-house because of sorts-of global isolation of India in this field. However, now that world economies are opening up to the idea of technological cooperation in nuclear energy field, one can definitely look forward to more reactors coming up. The hope for future of nuclear energy in India is further strengthened by the news of a reactor in Rajasthan completing more than two years of continuous running for energy production. Usually, most nuclear plants globally need to be shut down every year for maintenance; only well-maintained facilities can run for longer periods. Unit-5 at Rawatbhata ( a small town in Rajasthan), a Pressurized Heavy Water Reactor (PHWR) made at a cost of Rs. 1200 crore in 2010, is run by the Nuclear Power Corporation of India Limited (NPCIL) and is now ranked number two globally (behind a plant in Ontario, Canada) for continuous generation of electricity by a nuclear plant. The accomplishment is significant because of the fact that this is an indigenously made plant with most technological aspects developed within India. This plant definitely is an achievement in India’s endeavour towards self-reliance in modern technology. If one looks positively towards it, the global isolation for years forced us to take an indigenous route in this strategic field and our scientists have not let us down a bit. However, amidst this hope there are still several aspects which could hamper growth of nuclear energy adoption. We still have to sort out the domestic issues including public sentiment satiation. Indians are still apprehensive about long term medical impacts of nuclear plants in inhabited areas of the country. Then we are also faced with lack of robust methodology to discard the nuclear waste generated during power production. The waste can be radioactive and dangerous for a long time and a suitable protocol need to be developed to handle it. I hope government realizes these issues and addresses them to everyone’s satisfaction. In the meanwhile we can definitely look forward to more such small steps towards a energy-self-reliant India.